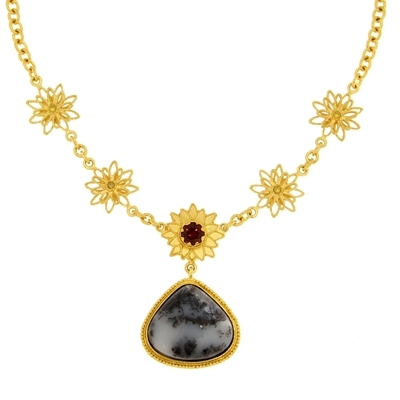 Gold 750/1000 necklace with dendritic opal (3,5 gr), spherical facet garnet (ct. 1) and 4 yellow diamonds (0,06 ct). The necklace is totally handcraft realized with hammered sheet, flowers of filigree and granulation. Nickel free. 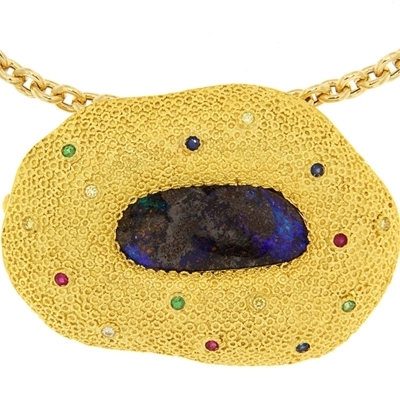 Gold 750/1000 pendant with a central boulder opal (6,75 ct), 6 yellow diamonds (0,09 ct), 3 tsavoriti (0,04 ct), 3 ruby (0,04 ct) e 3 sapphires (0,04 ct). The pendant is totally handcraft realized with hammered sheet and filigree. Nickel free. 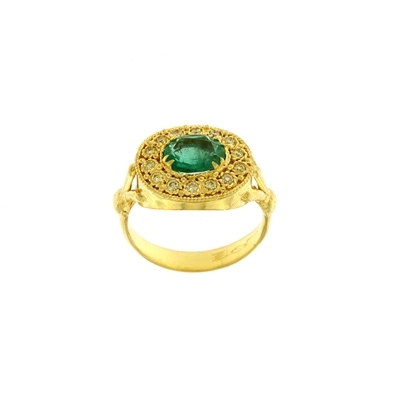 Dimensions: 50x36 mm. Opal: 22x9 mm. The chain in photo isn't included in the price.